Murakawa Wins Kisei B League: All the fifth-round games of the 39th Kisei Leagues were played on October 2. In the B League, Murakawa Daisuke 7-dan (right) of the Kansai Ki-in had stumbled in the fourth round, but he made no mistake in the fifth: taking black, he beat Cho Chikun, 25th Honinbo, by 3.5 points and secured first place. His only remaining rival, Yoda Norimoto 9P, also won his final game, so he ended up with the same score, 4-1, as Murakawa, but the latter’s number one rank in the league gave him priority. In the A League, Yamashita Keigo made a clean sweep. He will meet Murakawa in a play-off on November 13. (A League) Yamashita (W) beat Yamashiro Hiroshi 9P by resig. ; Takao Shinji Judan (W) beat Ichiriki Ryo 7P by resig. ; Yuki Satoshi 9P (B) beat Kobayashi Satoru 9P by resig. (B League) Murakawa (B) beat Cho Chikun by resig; Yoda Norimoto 9P (B) beat Cho Riyu 8P by 5.5 points; Kono Rin 9P (W) beat Hane Naoki 9P by resignation. Hane and Ichiriki drop out of the A League and the two Chos drop out of the B League. Mukai Leads Women’s Meijin League: Mukai Chiaki, Women’s Honinbo, retains the lead on 3-0. Kato Keiko 6P and Aoki Kikuyo 8P are in second place on 3-1. (Oct. 2) Kato Keiko 6P (W) beat Ishii Akane 2P by resig. (Oct. 10) Aoki Kikuyo 8P (B) beat Mannami Nao 3P by 4.5 points. Iyama Rebounds In Meijin Defense: Fans were starting to speculate about the possibility of a new Meijin when the challenger Kono Rin took a lead after the third game, but Iyama Yuta Meijin (right) has bounced back with two wins, so he is now in the better position. The fourth game was played at the Westin Miyako Hotel Kyoto in Kyoto City on October 6 and 7. This was a very important game for Iyama, as a loss would put him in a very disadvantageous position. Although there was no move by Kono (white) that could be labeled a mistake, Iyama gradually took the lead in the second day’s play. In retrospect, Kono’s strategy in pulling out some stones inside Iyama’s territory may have been dubious. Although the way he pulled them out was clever, he provided Iyama with a weak group to target. This let Iyama build up strength in the centre that turned the game in his favor. Iyama secured a safe lead — a few points more than the komi on the board — but as usual he didn’t let up. He set up a ko and used his superiority in ko threats to force a resignation after 217 moves. With the match tied 2-all, it had become a best-of-three. The fifth game was played at the Atami Sekitei inn in Atami City, Shizuoka Prefecture on October 15 and 16. It was a very interesting game, with Kono (black) playing an unusual variation of a joseki and Iyama coming up with a new move in the same joseki. The game developed into a contest between Kono’s territory and Iyama’s thickness. It was decided by a lapse in reading on Kono’s part: he overlooked a move with the double threat of a two-approach-move ko for one of his groups and a direct ko for another. The move wasn’t actually played, as Kono woke up to it belatedly and amended his play, but he had to let Iyama set up the two-approach-move ko. Such a ko would not usually be a big problem, but in this game Iyama had an overwhelming advantage in ko threats. Kono had to ignore a ko threat, but that let Iyama eventually kill a group. Kono resigned after White 176. The sixth game will be played on October 29 and 30. 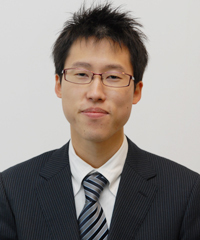 Iyama Off to Good Start In Judan: If Iyama manages to defend his Meijin title, he will once again have a chance to aim at a simultaneous (that is to say, a genuine) grand slam next year. 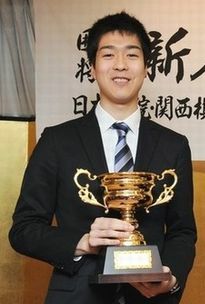 He needs to keep defending his six current titles, of course, and also to win the Judan title. He has made a good start in the 53rd Judan tournament. On October 10, playing white, he defeated Yoda Norimoto 9P by resig. in the first round (which has 20 players, four of whom are seeded into the second round). He needs to win three more games to become the challenger.